WASHINGTON -- Former House speaker and potential 2012 GOP presidential candidate Newt Gingrich called for America to replace the Environmental Protection Agency with an "environmental solutions agency" in a speech at the Conservative Political Action Conference Thursday, arguing that the EPA is currently full of "self-selected bureaucrats who are anti-American jobs." That effort, combined with the health care law, represents a "fundamental threat to freedom in this country," Gingrich said. He called for an end to "the EPA's war on the oil and gas industry" and the Obama administration's "war on American energy." NRA's Wayne LaPierre: "Government Policies Are Getting us Killed"
Michele Bachmann: China's Hu is "Your Daddy"
Gingrich emerged to "Eye of the Tiger" and, unlike the other speakers, walked through the aisle shaking hands with conference attendees. Though he has often flirted with a presidential campaign, Gingrich appears to be more serious about one this year, and the entrance seemed designed to cast him in the eyes of the 11,000 conservative activists gathered in Washington as a Republican rock star. The former House speaker, speaking quickly, opened his speech by comparing the American economy unfavorably to that of Germany, stating that the New York Stock Exchange has been "taken over by Frankfurt." He attributed that to the fact that the Obama administration is "anti-jobs, anti-small business, and anti-manufacturing." He also mocked the Obama administration for urging people "not to jump to conclusions" or "rush to judgment" in the cases of people like "Jihad Jane" and the Fort Hood shooter. The Obama administration, he said, is wrong on terrorism as well as Iran, the Muslim Brotherhood and other national security issues, something he called "enormously dangerous." Like many other CPAC speakers, Gingrich complained about the media, and specifically comparisons between President Obama and former President Ronald Reagan. "Barack Obama is no Ronald Reagan," he said, to thunderous applause from the audience. 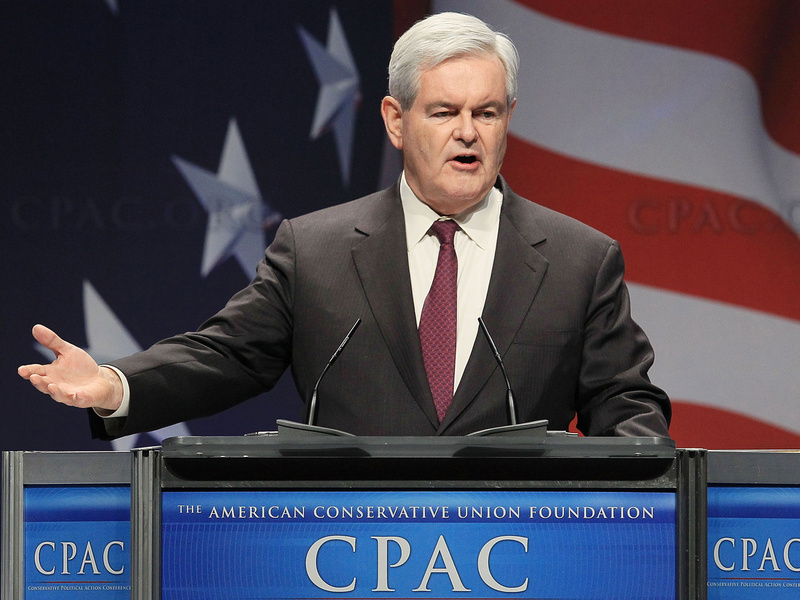 Left unmentioned in Gingrich's speech - as well as by most of the CPAC speeches - was the presidency of George W. Bush. Brian Montopoli is a senior political reporter for CBSNews.com. You can read more of his posts here.